Green Wings aims to promote tourism in the Riviera Maya by raising the ecological awareness of their travelers. Their main goal is to protect the environment, flora and fauna as well as culture and to involve travelers in a more responsible tourism. I am Nathalie, I’m from Belgium with Italian roots. I enjoy travelling, meeting people and discovering new cultures. After high school, I participated in a Rotary Students Exchange programme in Orizaba, Veracruz (Mexico) and I fell in love with this country. After university I worked a year in England, 2 years in Italy and I travelled for a year backpacking around Latin America. 13 years after my exchange, I decided to make of my dream a reality. I’ve always wanted to live in a sunny place near the beach. Since 2016 my home is in Playa Del Carmen (Mexico) with my 2 crazy cats (a Belgian one and a Mexican one). I love animals. .
GREEN WINGS is a French-speaking and international eco tour online agency in Playa Del Carmen, Mexico. Concerned by environment, Carole (French), Antonio (Mexican) and I created this adventure in May 2017. 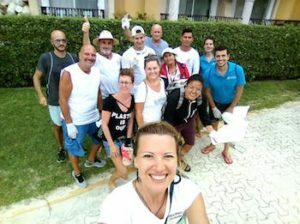 Our project is to promote the Riviera Maya tourism by raising awareness among our customers and creating an environmental consciousness. Our main goal is to preserve the environment, the flora and the fauna, as well as the Mayan culture and to involve travelers in a more responsible tourism. We offer a unique and authentic experience, in small groups, to provide our customers with quality service. We defend animal rights and more particularly sharks, dolphins, turtles and other sea animals by supporting their observations in their natural habitat rather than in aquariums. 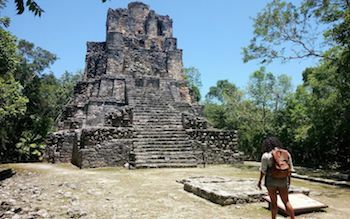 We support Mayan communities (often sidelined in tourism) them by offering, in most of our tours, the visit to their villages, the discovery of their traditions and their local cuisine. We commit to protect Nature: we organize a monthly beach clean up ; avoid as much as possible unnecessary polluting transports such as ATV’s ; promote plastic recycling in collaboration with our partners ; publish informative pictures and videos to wake up to the consequences of irresponsible tourism ; and to inform people of small simple and easy actions to protect Nature because every little act counts. In my personal opinion, there is a huge problem of pollution in the Mayan Riviera. This region is so beautiful with the Caribbean Sea, the Cenote, the Mayan pyramids etc. People, locals and tourists, don’t take care of it. For locals, there is a lack of infrastructures (bins, separation of garbage, recycling, etc.) and a lack of education about environment. It’s common to see people throwing their garbage out of the window of their car. It is unbearable! There are so much litter in the jungle, on the beach and along the motorway. Also, this region is full of business opportunities, some business people only see money and they don’t think about the consequences in a near future. As for tourists, some of them think that because there are in another country they can do whatever they want and they forget about the rules and Nature. But the planet is ours. They don’t realize that what they do abroad will have an impact on them as well. We are all connected to Earth, we should treat Nature with respect like a member of our family, like an ancestor. Luckily, a few private initiatives work in trash management. Some places like the Parque de la Ceiba or Choux Choux Café give you the opportunity to recycle. The government and the authorities should take more initiatives to preserve Nature. This should be a priority. We think that eco tours are the best way to travel by respecting the culture and nature of a country. Ecology is a triangular effect between Men, their action and their impact on the environment. Men committed with the future are the basic keys to the preservation of our world. Once a month, we organize a beach clean up in association with different partners (Totonal, Tank-Ha Dive Center, Burbuca among others). At the end of the clean up, we separate the garbage in the different bins ; the plastic caps for the association Banco de Tapitas which recycles them in order to provide a cure for kids with cancer ; and the cigaret buds for the associations Verde Halago and Terracycle which recycle them to make flowerpots. We have carefully selected our tour providers. They are the most eco friendly of the region. We communicate with them about sustainable alternatives for their tours. We advise our customers to use biodegradable sunscreen and repellent. And for each tour, we explain the ecological assets. Personally, I rarely use plastic bottles, I have 2 reusable bottles. I don’t own a car so I move on foot, by bike or by public transports. I use reusable cotton make-up remover, natural coco oil as a make-up remover and as a night / day cream, a moon cup, reusable cotton protectors, biodegradable shampoo / tooth paste / mouth wash / soap / sunscreen / repellent and litter for my cats plus I recycle. Unfortunately ecology is not a priority in this world. Yet! As we have the same aim. It is important to be united in order to have more power and to make people conscious. It’s time to take care of our planet.